I know…. It’s been awhile since I’ve posted a recipe. An end-of-the-year 7-week gig as a substitute teacher in a kindergarten class kept me very busy until the last day of school on June 17. I relied on quick and easy recipes that are already posted on my blog. The day after school got out I went to Boston for a few days. 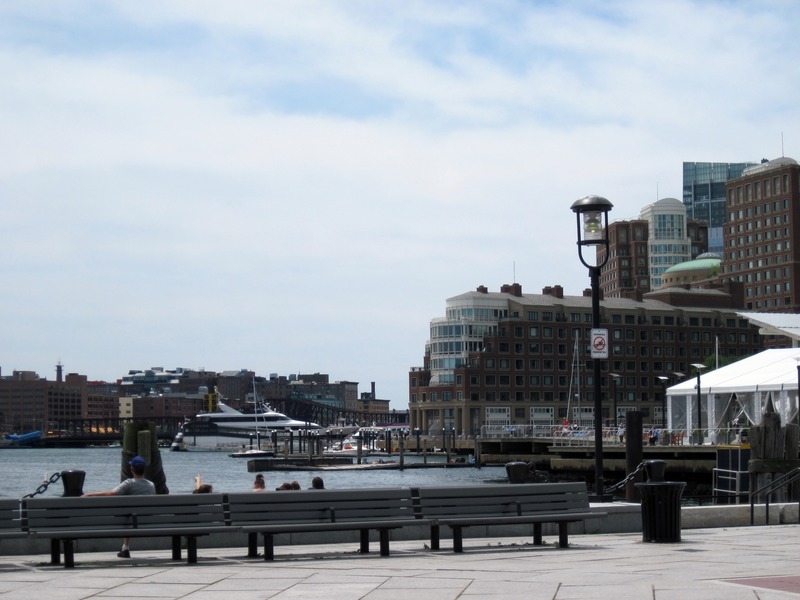 If you’re planning a visit to Boston, you may find this post interesting. If not, I promise I’ll be back in the kitchen soon to try something new! 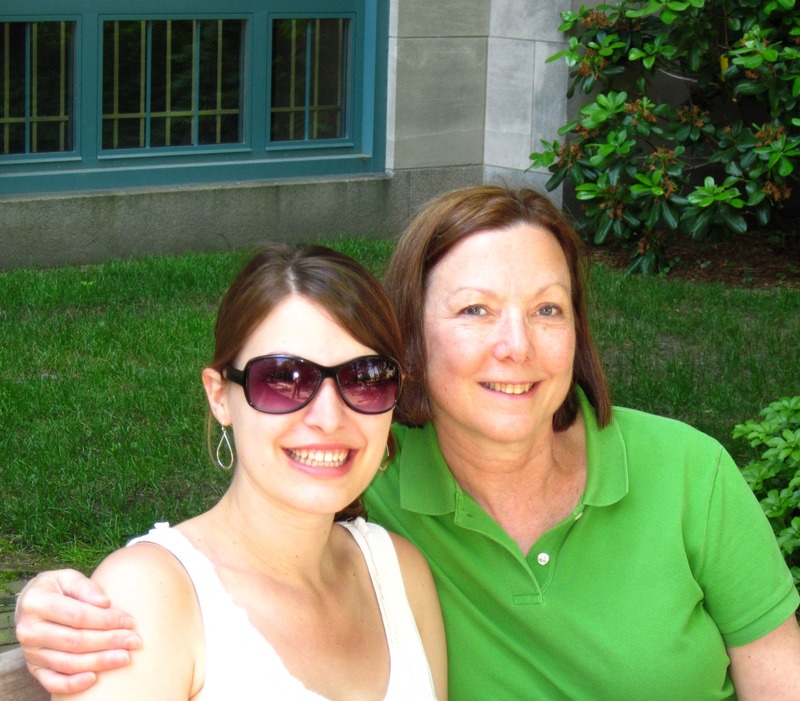 Last summer, after graduating from Pomona College, Carrie moved to Boston. Last Saturday, I finally had a chance to visit her. I was excited to see her, and I was excited to explore Boston since I had never been there before. My sister, Joan, joined me on the trip. After going through security at Sea-Tac Airport, we stopped at Kathy Casey’s Dish D’Lish for some food to take on the flight. We both got a cup of the couscous salad which turned out to be a great choice. It was surprisingly filling and loaded with great flavor with chickpeas, nuts, and fruit. Boston has a great public transportation system, so on our arrival we took the bus from Logan Airport to the South Station in downtown Boston. Carrie met us there and joined us as we continued on to our hotel. After checking in, we headed to Cambridgeto see Carrie’s apartment and then it was time to find dinner. I remembered the favorable review of Garden at the Cellar that Jen of Tiny Urban Kitchen had written. The restaurant was only 2 short blocks from Carrie’s apartment so we decided to try it. There were so many interesting appetizers and small plates at Garden at the Cellar! We had a hard time choosing, but finally settled on Bacon Wrapped Dates, Crispy Lobster Tempura, Char Grilled Baby Octopus, Seared Scallops, and the Rosemary-Truffle Fries. Everything was great, but I especially loved the lobster and the fries. Although the restaurant didn’t seem too busy for a Saturday night, we noticed that the downstairs bar was packed. It’s apparently a very popular place for a drink and something to eat from the bar menu. After dinner, we walked to Harvard Square to go to Grendel’s Den, a popular place for inexpensive food and drinks. We had an after-dinner drink, talked about plans for the next day, and then called it a night. On Sunday we met Carrie at her apartment and then headed to Zoe’s for breakfast. What a fantastic breakfast spot! There were so many choices on the menu; Carrie loves the Sweet Potato Pancakes. I decided to keep it simple, though, and chose eggs with homefries and an English muffin. 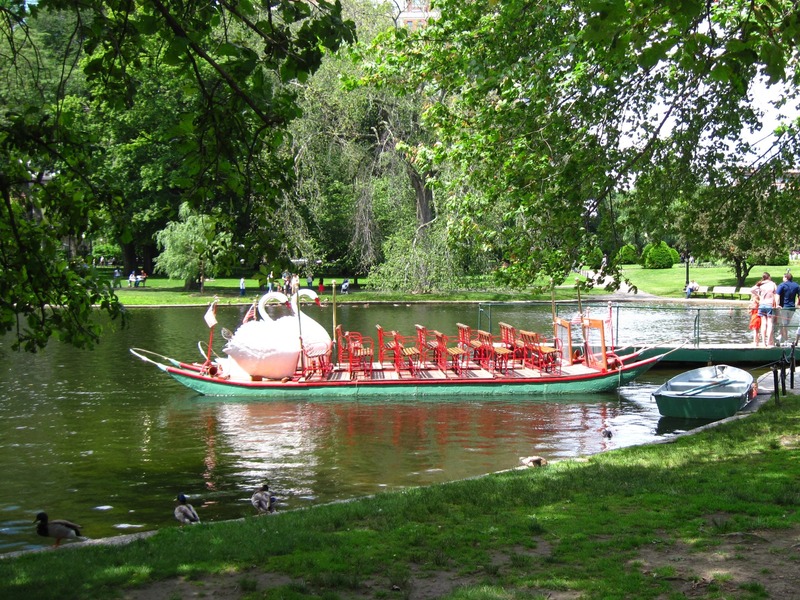 Our first activity was a stop at the Boston Public Garden where we saw the famous Swan Boats and the statues of the ducklings from Robert McCloskey’s Make Way for Ducklings. It was a beautiful day and Father’s Day, so there were many families enjoying the park. The State House, which is called the “New State House” by Bostonians. 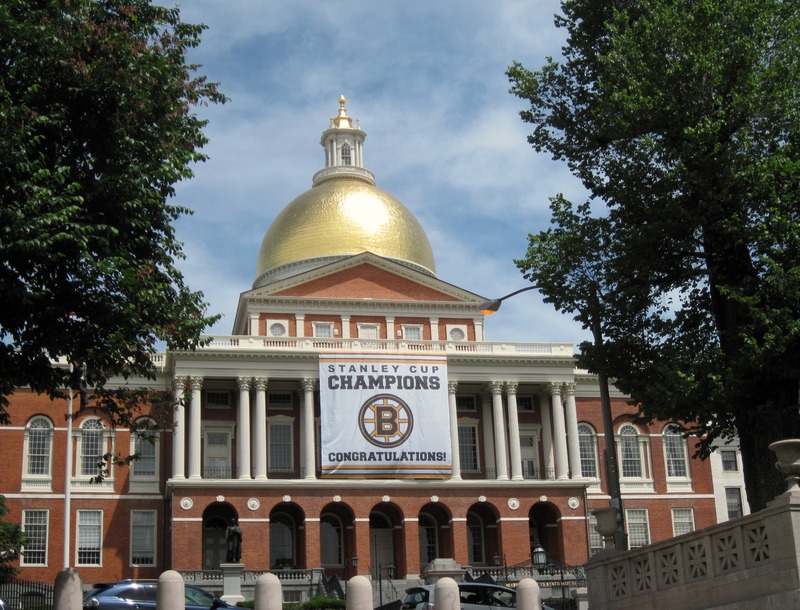 During our visit it was decorated with a large banner congratulating the Stanley Cup Champions – the Boston Bruins. The Bruins had just days earlier defeated the Vancouver Canucks in game 7 of the championship. 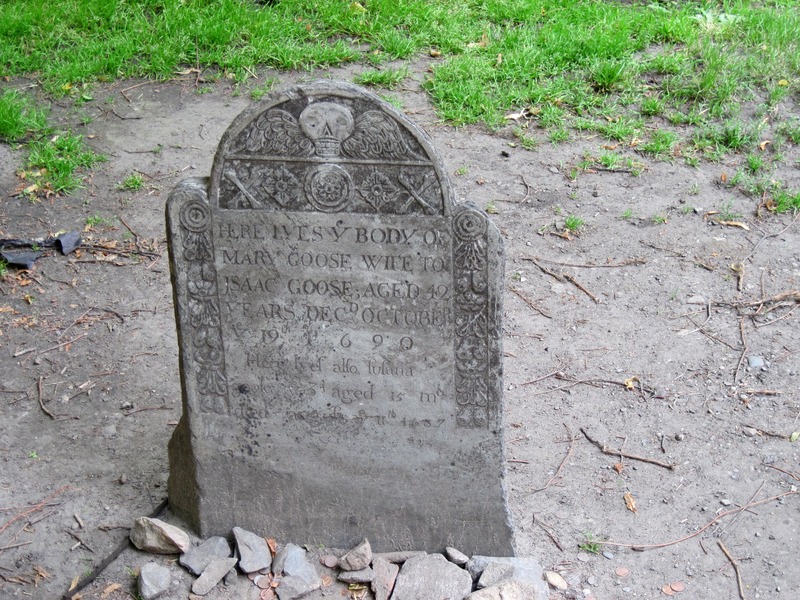 The Granary Burying Ground is where many famous Bostonians are buried, including Paul Revere and Mother Goose (Mary Goose) who died at the age of 42 in 1690. 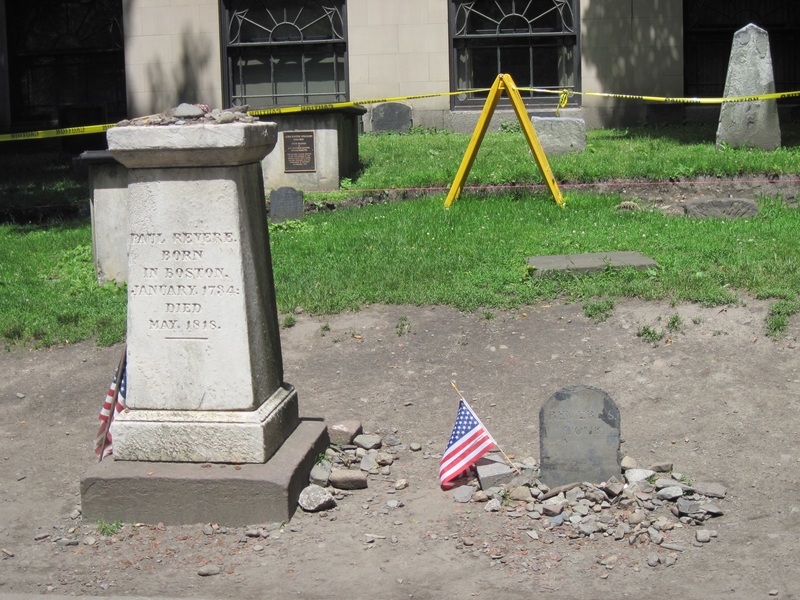 The small marker on the right marks Paul Revere’s grave. 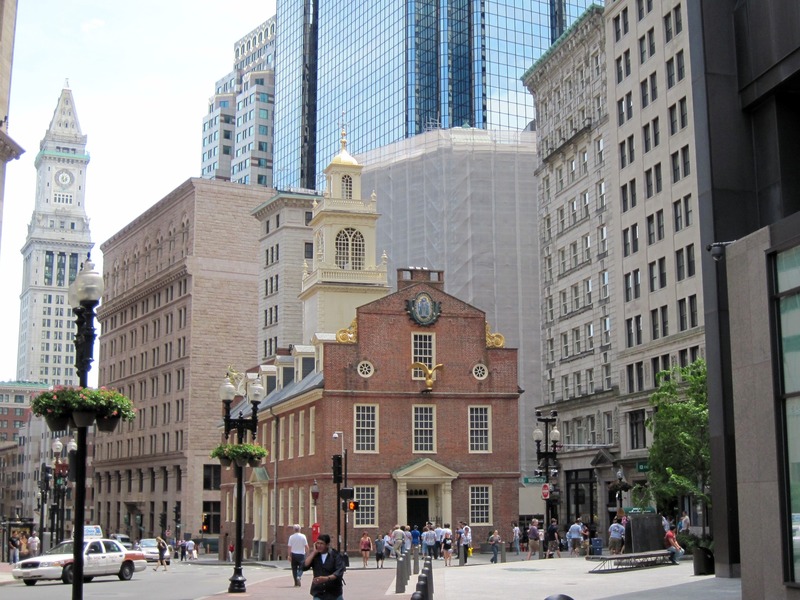 The Old State House was originally the seat of the British government, but before the Revolution it became the Commonwealth’s first capitol building. It is from this building that the Declaration of Independence was read to the people. 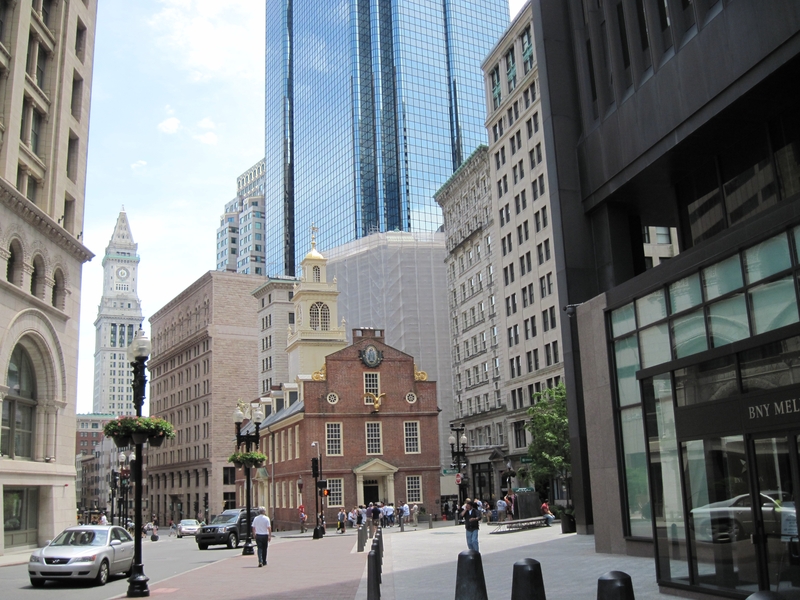 Today it is surrounded by the modern buildings of downtown Boston. We walked to the Boston Harbor where I had hoped to see the USS Constitution (“Old Ironsides”), but she was not in port when we were there. Next time. At this point on the Freedom Trail we were in North Boston, which is a large Italian neighborhood. There are many Italian restaurants, but we chose to have lunch at Neptune Oyster. Our mission was to try their lobster rolls after reading about them in a Gourmet article from 2008. They don’t take reservations so a wait is not unusual. On Sunday (Father’s Day) we were told the wait would be 1½ hours. They took my cell phone number and we headed off to explore some more of The Freedom Trail. Since we had to wait so long for lunch, we decided to have dessert first. We made a quick stop in Modern Pastry Shop (which Carrie likes better than the more famous Mike’s) and got cannoli to go. We found a bench at the nearby Paul Revere Mall and ate our cannoli by the statue of Paul Revere on horseback. After our dessert break we headed to The Old North Church. 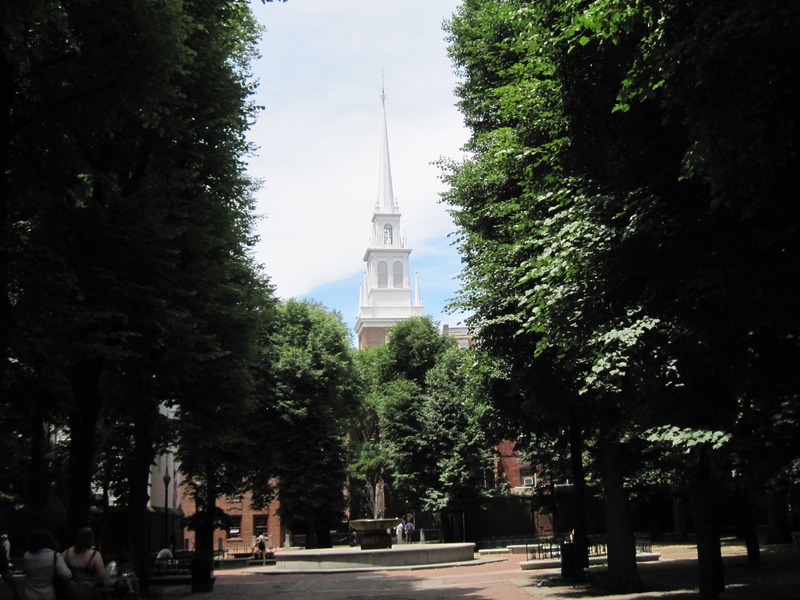 The Old North Church was Paul Revere’s destination on his midnight ride on April 18, 1775. From the steeple, he hung two lanterns to let the patriots know that the British were arriving by boats on the Charles River. (“One if by land, two if by sea” – Longfellow) The interior is quite beautiful. It is painted white and the pews are divided into individual family boxes. 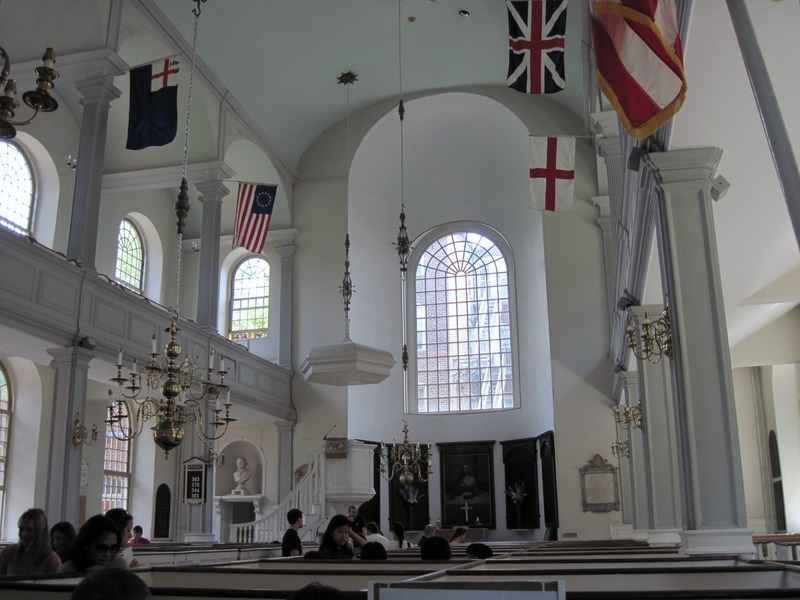 Today The Old North Church is an active Episcopal Church. We decided to head back towards Neptune Oyster. When we were less than a block away my cell phone rang. Our table was ready! I was tempted to try one of the many varieties of raw oysters that they have, but I knew I would have plenty of food with the lobster roll. Carrie, who doesn’t like mayonnaise, ordered the “Connecticut-style” warm roll with melted butter. I ordered the cold roll, Joan ordered the warm roll, and we split them. The cold, traditional roll was very good, indeed. It was just lobster, and lots of it, tossed with just a bit of mayonnaise and served in a brioche roll. We all agreed, though, that we liked the warm lobster roll best. It was incredible! People around us were ordering other things from the menu and everything looked fantastic. I highly recommend Neptune Oyster if you’re ever in Boston. After lunch we headed to the Isabella Stewart Gardner Museum. Isabella Stewart (1840 – 1924) was from New York City. She married John Lowell Gardner, Jr., who was from Boston, in 1860. Isabella and Jack, as he was known, travelled the world and loved art; in 1891 Isabella inherited a fortune from her father and she and her husband used the money to collect art. They planned a building to house the art, but Jack died in 1898. Isabella completed the project and she moved in to the 4th floor (not open to the public) in 1901. In 1903 she opened the museum to the public. Isabella decided how the art should be displayed in the museum; in her will she stipulated that everything should remain as it was and that nothing could be identified by labels. I thoroughly enjoyed visiting this unusual museum. The building, with its beautiful courtyard, is as fascinating as the art that it houses. As we were walking out of the museum, Carrie got a call from her friend, Mairead. She and her mom were just pulling up across the street from the museum to meet us. We had planned this rendezvous, and the timing was perfect! 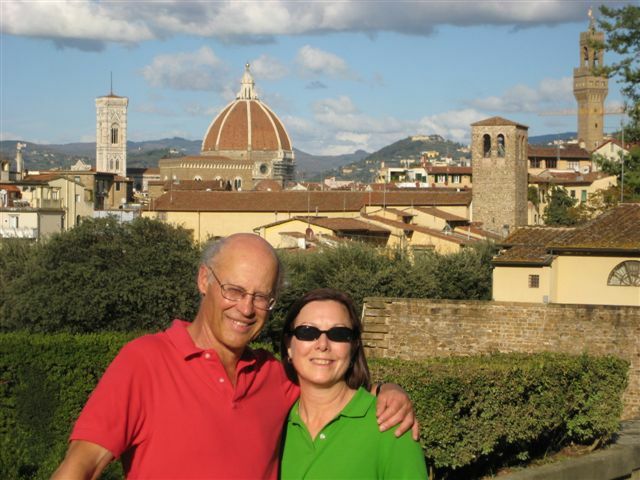 I had met Mairead in Italy when she and Carrie were studying abroad, and again at Pomona College where they went to school. I was excited to meet Mary Kate! She generously let Carrie stay with them in Andover when Carrie first moved to the Boston area. Carrie lived with them for about a month while she found a job and then an apartment in Cambridge. She is Carrie’s “Massachusetts Mom”. Plus we have the same name! We’re both Mary Kathleens! Carrie, Joan, and I hopped in their car and we headed to Brookline where we went to J.P. Licks, a local “homemade ice cream café” that features their own roasted coffee as well as their ice cream. They have several locations in the Boston area and are very popular. I was still too full from lunch to try the ice cream, but I had an excellent iced coffee latte. Carrie’s boyfriend, Rhett, who lives in Brookline, took a brief break from work to meet us. After our coffee/ice cream break, Mary Kate took us on a bit of a driving tour around Brookline, Allston, and as far west as Boston College. It was fun to see some of the neighboring areas of Boston. We ended up back at Carrie’s apartment to relax and visit before Mary Kate and Mairead headed back to Andover. It was so great to finally have a chance to meet Mary Kate, and it was fun to see Mairead again. Dinner Sunday night was at one of Carrie and Rhett’s favorite Italian restaurants in North Boston, Ristorante Limoncello, and Rhett was able to meet us there for dinner. It was excellent! I thoroughly enjoyed the Taglionini al Limoncello, which was fresh homemade pasta with shrimp and a tasty tomato cream sauce. Carrie enjoyed her Rosette al Montasio ed Olio di Tartufo (pasta with Montasio cheese, prosciutto, and white truffle oil). Joan had the homemade cheese ravioli with a flavorful tomato sauce, and Rhett chose a stuffed pork chop that looked terrific! Dinner at Ristorante Limoncello was the perfect end to a full day. Monday morning we met Carrie and headed off to the Central Square Flour in Cambridge for breakfast. I had heard of Flour, and I thought the Cambridge location was the original. I learned from the website, though, that Joanne Chang opened her first Flour in South Boston; the Cambridge restaurant is her third location. If you are in Boston, I highly recommend Flour for a breakfast or lunch stop. Everything looked so good! There were sweet and savory choices in the morning. For lunch there are several sandwiches to choose from. Carrie says the cookies are addictive. 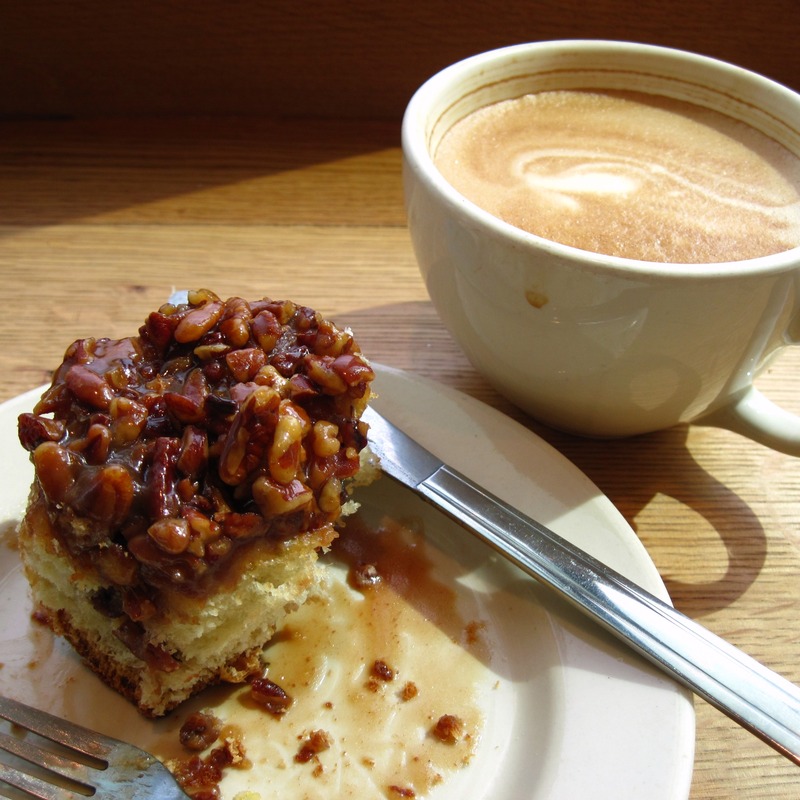 I chose the sticky bun and a latte for my breakfast. It was, without a doubt, the best sticky bun I’ve ever had! I’m really not much of a yeast baker, but I have requested Chang’s Flour cookbook from the library (there’s a waiting list here in Seattle) and it may be one I have to add to my own cookbook library. The sticky buns are featured on the cover! I had eaten almost half of the sticky bun before I thought to take a picture! Our plan after breakfast was to take the Red Line and then transfer to the Green Line to go to Boston University where Carrie will be starting graduate school in September. When we got there, though, we heard that an elderly man had fallen on the tracks and the Red Line was shut down. (We were glad to learn later that he had been rescued and was recovering in a hospital.) So we walked through the MIT campus and across the Boston University Bridge to BU’s campus. It was a bit of a hike, but it was interesting to see some of the MIT buildings. 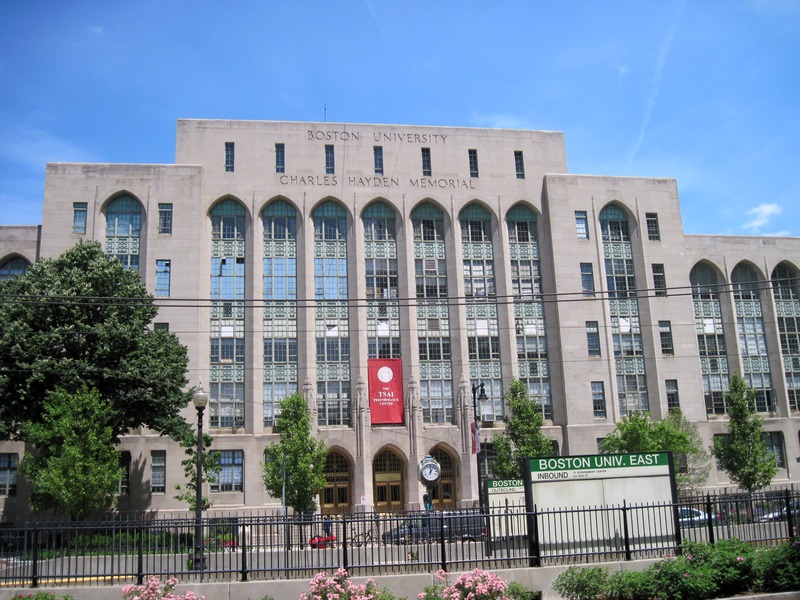 Boston University is a large private research university with over 31,000 students. 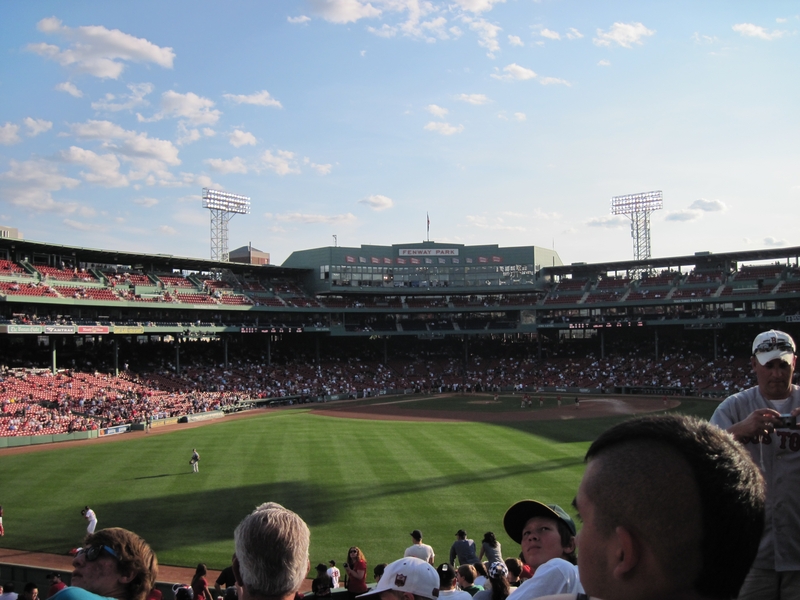 It is the fourth largest employer in Boston. 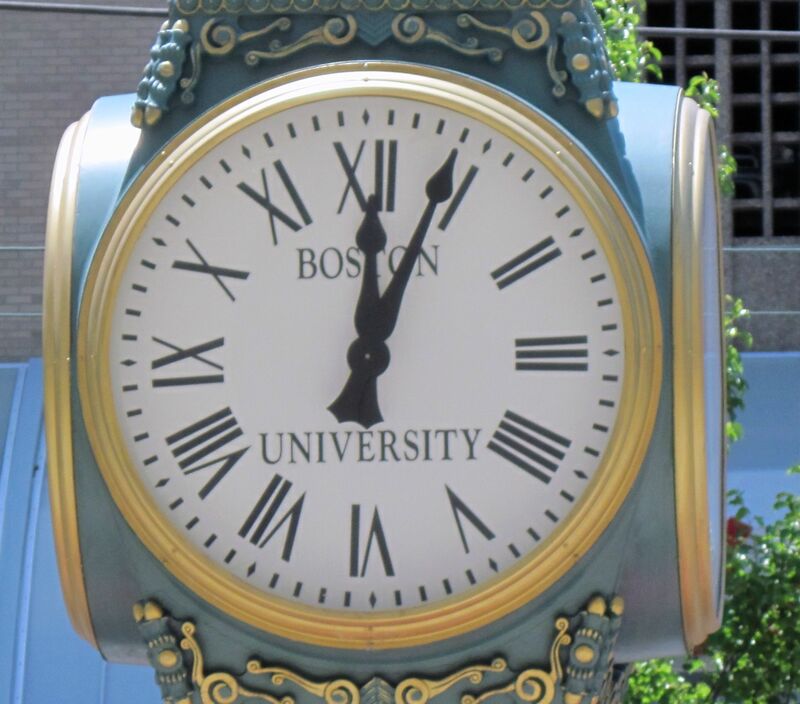 Carrie’s personal university world, however, all lies just east of the Boston University Bridge. We first stopped in the George Sherman Union, the student union which is quite attractive inside with several restaurants in the food court for a quick meal or a cup of coffee. 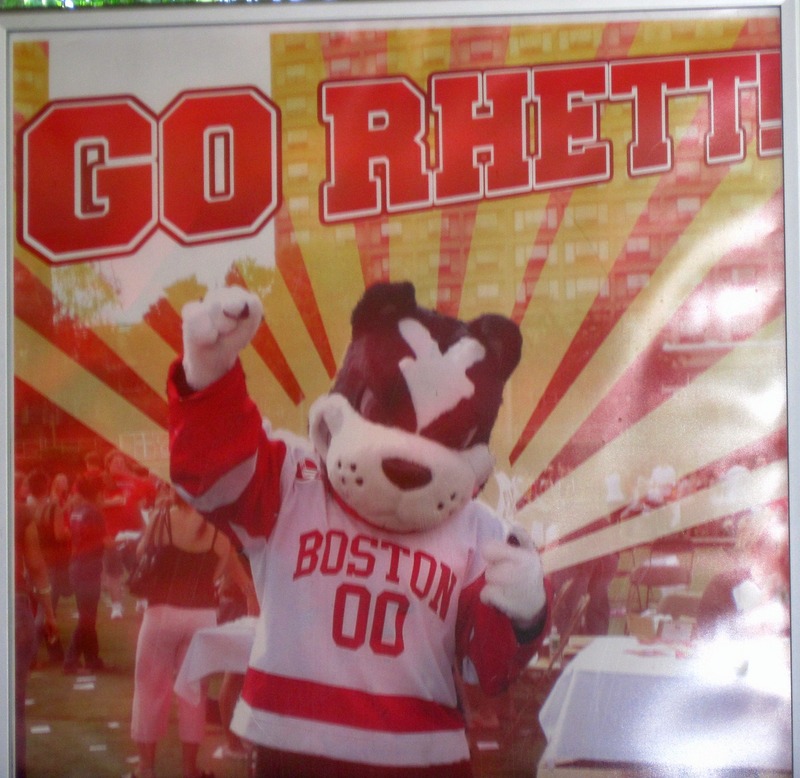 It was here that we learned that BU’s Boston terrier mascot is named Rhett. Mugar Memorial Library, the main campus library, is right next to George Sherman Union. Just a few steps east of the library is the College of Arts and Sciences where Carrie will be taking her graduate courses in Art History. It was a beautiful afternoon, so we checked out the “beach” behind the College of Arts and Sciences. There was no sand to be found, but it is a nice park-like area overlooking the Charles River. 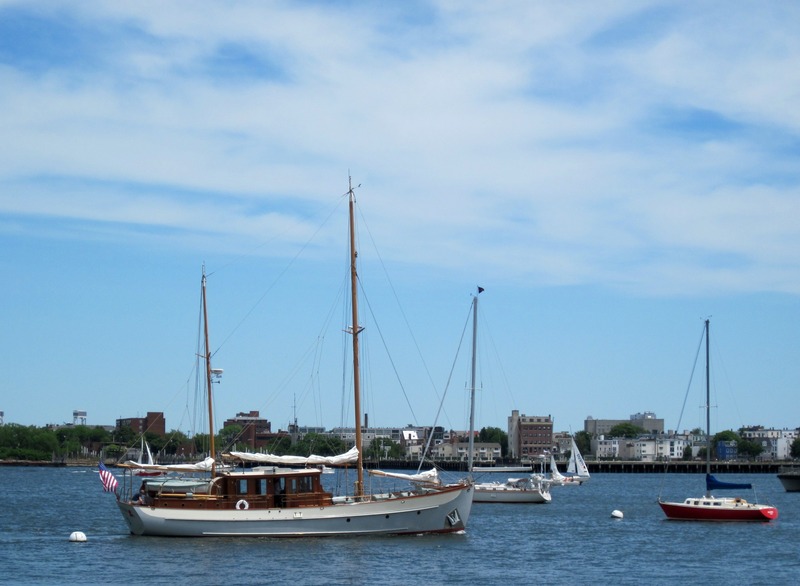 Carrie commented that grassy areas by water are often called beaches in Boston. We enjoyed sitting on a bench in the shade and watching the crazy squirrels. The Abbey appears to be a relatively new restaurant. The interior was quite nice and we were greeted by good smells when we walked in. The waitress informed us that they were out of the burgers and the chicken sandwiches, which seemed a bit odd at 1:00, but there were plenty of other choices on the menu. Joan chose the smoked cod fritters and arugula salad from the Small Plates and Appetizers. Carrie went for the spicy tomato bisque and grilled cheese Panini. I was actually in a burger mood, so I settled for the 4 oz. filet mignon sandwich with crispy shallots, horseradish aioli and hand-cut French fries. It was so good that I was glad I hadn’t been able to order the burger. The steak was tender and cooked to perfection. The fries were outstanding and there were plenty to share with Joan and Carrie. At this point we decided it was a good idea to go back to Carrie’s apartment for an afternoon rest before going to Fenway for a Red Sox game! Joan and I actually took short naps. After a short walk around Harvard Square we went to Rhett’s office building in the Coolidge Corner area of Brookline to get our Red Sox tickets. Since he had to work a bit longer, he would meet us at Fenway. After iced coffee and iced tea at Finagle-a-Bagel we boarded a very crowded Green Line train. Besides being the train to take to Fenway, it was rush hour. Fortunately, it was a short ride. Dinner was, of course, kielbasa on a bun with onions, peppers, and mustard from one of the vendors just outside of the stadium. Bob is still talking about the kielbasa he had at Fenway when he visited Carrie in April. He calls it the best “hot dog” he has ever had…. In his life…. I don’t think I could have gone home if I hadn’t tried one. It was actually very good and substantial enough to be a filling dinner. We ate it standing up watching the Red Sox fans stream by. Once inside the stadium I could see why it’s a favorite. The small size makes it feel much more intimate than most baseball stadiums. I felt close to the action even though we were in the bleachers behind the outfield. For the most part, the advertisements in the stadium are subtly painted signs. The weather was perfect, and it was a great baseball experience! I cheered for the Red Sox (since they weren’t playing the Mariners), we joined in singing “Sweet Caroline” just before the bottom of the 8th, and the Sox beat the Padres 14 to 5. After the game we walked away from Fenway to find a less crowded spot for buses, trains, and taxis. We bid adieu to Rhett, and walked to a spot where Carrie could catch her bus. Since we had an early morning flight, we said our goodbyes to Carrie, and Joan and I got a taxi back to our hotel. Our trip to Boston was too short, but we crammed a lot into a couple of days. I’m looking forward to my next visit to see more! The food in Boston sounds AWESOME! Especially the pickings at Garden at the Cellar….ym! Wow! You sure did pack a lot into a couple of days! Very informative. Makes me want to visit. I think I have to check out Boston Mac and Cheese. See how it compares to mine. Boston’s a great place foodwise and the flour cookbook is great (my mom gave it to herself for Christmas). i HIGHLY recommend her carrot cake recipe, it’s amazing! Wow what a great walk through these gorgeous parts of the city, I just love these photo’s! Thanks so much for visiting Blogsgotheart today!